30 minutes 3 times a week with God. I did two. I “knew” I was going to be perfect. I wasn’t. Walk/run 175 miles. Nope. not even close. Develop post 1 recipe a week. Not this week. I was so busy with all of my extra stuff. Oops! Get 1 item done on the “Honey-Do” list a week. I will make this one up this week–I’m planning on doing 2 items. I know it’s not the average that counts (at least the way I set it up), but it sure will make me feel better! Not sure what to think of this. I didn’t give it my all for the last two weeks–and didn’t have a chance to weigh-in last Sunday–but for some reason I’m not worried at all. 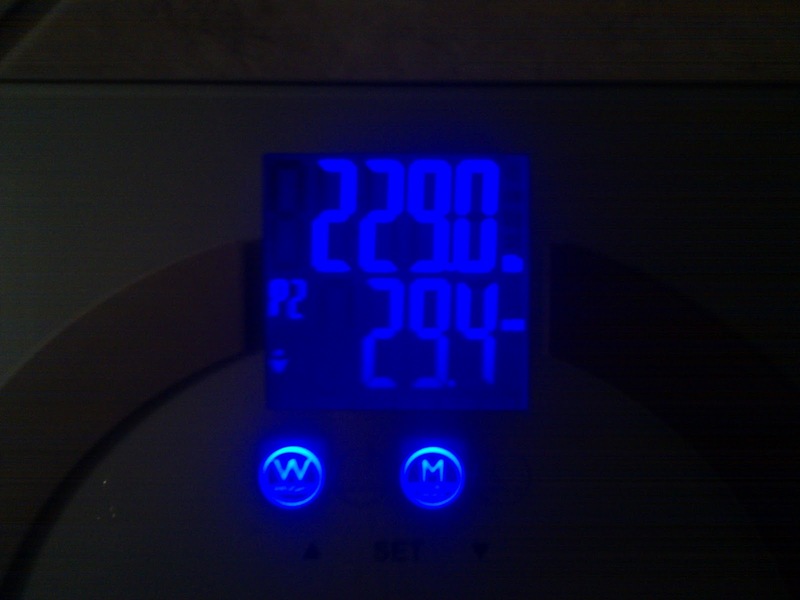 I’m glad to see that I didnn’t extend my weigh-in to ensure a loss; that sure didn’t happen here. But I’m really thinking that this might be closer to my real weight (probably something in-between): I tend to work out way more toward the end of the week and probably end up with a deflated weight. Does that make sense? Nonetheless, look for a decent/above average loss by next Friday. Hmmmm… We gotta do something about that! The good news is that you are tracking!! Even though you're eating too much, you're at least being honest and tracking. Good for you! You know what you got to do to get this right! You have the answers, it's time to apply them! Focus on the positive!!! We want to see some green next week! I guess the good thing about the gain is that there is little chance it is real fat. You will probably lose several pounds of that very quickly.I will agree with Debbi, I want to see more green – wait, I want to see all green – next week. You'll do it Beej, I know you will. Just watch things a bit more closely, work out just a few extra times and you'll have it back to where you want it. Take care and have a blessed week. 100 sit-ups beej…..wow! I can do about 2 sets of 15 (3 sets if i'm feeling fresh) and i'm done for the day. Good going, and glad to see you take the gain in stride. Um, probably not the best time to ask this, but I'm dying to know. Did you win the contest at work? Hope things settle down for you soon — you've been on a whirl!